Many years ago, when thirteen-year-old Lizzie was still three, it was my job to drive her to pre-school, nine miles away. When God made my little girl, he built her for conversation. Lizzie would have no part of my preferred sports talk radio. Instead, she would demand, “Tell me a story.” That’s how the tales of Karigi, the Eskimo girl, were born. The very first tale began with Karigi and her father’s rescue of a half-frozen polar bear cub. With the mother nowhere to be found, they eventually adopted the cub. Over time, and many morning commutes to school, the relationship between Karigi and her ursine companion developed almost shamanistic powers within her to understand animals. Through the vehicle of Karigi, I attempted to teach Lizzie lessons about such things as self-reliance, self-donation, and the value of intellectual pursuits, including homework (albeit, that one was a stretch). Given a five-day workweek, there are right around 250 commutes per year. In an effort to develop more and more episodes to cover those rides, the plot lines began to jump the shark. And needless to say, Lizzie grew up. Sadly, we had to shut down the Karigi franchise. But, when the stories were still fresh, they would usually linger over the imagined details of Eskimo domesticity. One of the earliest narratives catalogued how Karigi’s father would cut and stack blocks of snow and ice. Having constructed a frozen dome, he would set about driving seal bone nails through thick, musk oxen skins for insulation inside of the structure. Plush ox fur carpeting, thick ox fur insulation/wall paper, along with whale blubber lamps, heated Karigi’s winter dwelling to a cozy sixty-five degrees Fahrenheit. I don’t know how well the lessons stuck, but from time-to-time, Lizzie would make reference to Karigi and the igloo she and her family occupied. Many times, we have discussed how fun it would be to build our own igloo out of Saint Louis snow. An hour later, twelve huge, snow boulders were gathered into a circle Stonehenge-style. When Lizzie and her cousin arrived home from a music recital, they shrieked in delight as they surveyed the fruit of my procrastination. Immediately they gathered their snow gear. It wasn’t long before my daughter requested, “Daddy, can you help us put another layer of snowballs on top before you go?” Game on! Four hours, and no Christmas presents later, as darkness set in, we noticed that the snow we had been packing all afternoon had grown too cold for molding a roof. Sadly, we walked up to the house, resigned that our structure would remain a half-domed snow fort. “Wait!” I exclaimed. “What if we put wood over the top, and covered it with snow?” Lizzie pumped her fist and shouted, “Yes!” I hate to brag, but if we could have located a few musk ox skins, and whale oil lamps, I’m sure that Lizzie, Luke and I could have spent the night in our spacious, homemade snow globe. This Sunday, as we begin a new year, it is worth taking a moment to explore the nature of holiness. I have a theologian-friend, Jim Linhares, who is to spiritual theology, what Eskimos are to snow. He has immersed himself in it, and developed a rich vocabulary to describe holiness in its many varieties. 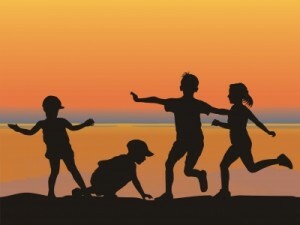 In one of the articles in his blog, “spiritintheworld.com” he thoroughly treated the topic of play. He beautifully described play (and outdoor play in the fresh air) as an important form of holiness. He warns in his work, what Cat Stevens warned in his song, “Where do the Children Play?” (1970). With the realization of a plugged in world, dual income families, and the proliferation of select/club sports, spontaneous, creative, outdoor play is now an endangered species. About two hours into our igloo construction, it occurred to me that very little Christmas shopping was getting accomplished. That’s when it dawned on me that the gift I was giving Lizzie by playing in the snow with her was so much more valuable and long-lasting than anything I could buy for her in a store. Long after the pieces to the Christmas board games have gone missing…long after this year’s Christmas sweater has grown thread-bare…when all the candy has been crushed, and all of the angry birds have been silenced…the traces of a co-constructed igloo will remain within the souls of a girl, her dad, and his nephew. In light of all of this, I would like to propose a potential New Year’s resolution. This year, could you determine to procrastinate a little more to create space for play? In our play with one another, we incarnate an important dimension of Christ who breaks into our existence calling for us to come out and play.